Order in the next 1 hour, 18 minutes an 40 seconds for same day shipping. 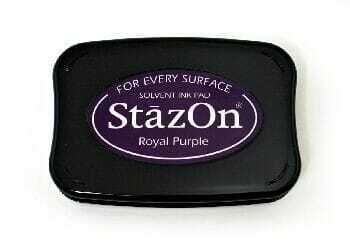 Royal Purple StazOn Ink Pad for Stamps. StazOn is a fast-drying solvent-based inkpad designed for decorating non-porous surfaces such as glass, metal, shrink plastic cellophane, aluminium foil, leather and acrylic. Customer evaluation for "Tsukineko - Royal Purple StazOn Pad"